Herbs/Botanical plants are considered as Gods gift to human beings in the form of natural medicines, like the one well known Sanjeevani booti described in Hindu Mythology. The traditional and ethno-veterinary practices have been in use for centuries, transferring the knowledge from generation to generation and they are accessible, easy to prepare and administer, with little or no cost at all. Even though the modern developments in therapeutic field brought about a rapid decline in traditional medicine, the plant-based remedies are still having a crucial role as potential source of therapeutic aids in health systems all over the world for both humans and animals. Among the 21,000 medicinal plants listed by the World Health Organization (WHO), 2500 species are native to India, which stands first in the production of medicinal herbs. This innumerable treasure of medicinal herbs brings India the distinction of the botanical garden of the world. Nowadays immune-based therapies are gaining more importance than monovalent approaches which are having limited benefits. Apart from the actions like treating diseases, control of ecto- and endo-parasites, fertility enhancement, bone setting and poor mothering management, an array of herbal medicines have been reported which are having immunomodulatory effects like modulation of cytokine secretion, histamine release, immunoglobulin secretion, class switching, cellular co-receptor expression, lymphocyte expression, phagocytosis and so on. The present article describes in brief few of these important ones viz., ashwagandha, amla, tulsi, arjuna, aloe vera, garlic, turmeric, ginger, shatavari, neem, guduchi, kiwifruit, tut, kamala, palashlata, kokilaksha etc. being used for human and animal health benefits. Mahima , Anu Rahal, Rajib Deb, Shyma K. Latheef, Hari Abdul Samad, Ruchi Tiwari, Amit Kumar Verma, Amit Kumar and K. Dhama, 2012. 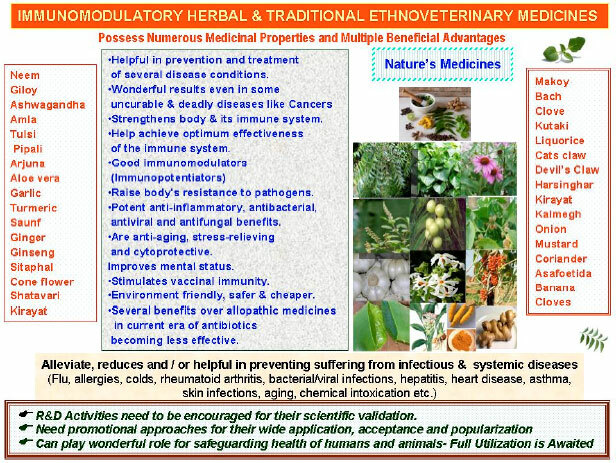 Immunomodulatory and Therapeutic Potentials of Herbal, Traditional/Indigenous and Ethnoveterinary Medicines. Pakistan Journal of Biological Sciences, 15: 754-774. In 21st century, world is facing the problem of population growth, increase in the incidences of the disease, unemployment and change in ethical values (Mahima et al., 2012a). Due to development of antibiotic resistance by the bacteria (Verma et al., 2007; Lambey et al., 2009; Kumar et al., 2011, 2012a, b) and antiviral resistance (Verma et al., 2012) by the viruses, the researchers are now thinking towards immunomodulation. The term immunomodulation is generally used to describe the pharmacological manipulation of the state of activity of the immune system. Immunomodulators either make an increase or decrease in the magnitude of immune response. The augmentation of immune response is known as immunostimulation/immunopotentiation while suppression of immune responsiveness is termed as immunosuppression (Chauhan, 2010). From a therapeutic point of view, immunomodulation refers to a process and a course of action in which an immune response is altered to a desired level (Archana et al., 2011). The development of science and biotechnology particularly in field of nutrition leads to the formation of designer milk (Mahima et al., 2012b) and designer eggs (Mahima et al., 2012c) that can also be used for enhancing the immunity (Mahima et al., 2012d). The uses of herbal plants as health promoters are gaining increasing attention in both consumer and scientific circle (Upadhayay et al., 2011; Hashemi and Davoodi, 2012). Various physiological products, microbial products, synthetic chemicals, cow therapy (panchgavya) (Verma, 2005) and herbal products have immunomodulation property. Among these, the herbs exhibit an array of diverse biological activity such as antistress, adaptogenic, anti-ageing and immunomodulatory activity. Many herbs are being used by veterinarians fruitfully to treat a variety of conditions of animals as well as in birds (Dhama et al., 2012). Herbs provide potent anti-inflammatory, antibacterial, antiviral and antifungal benefits. Improvements have been shown or reported with those suffering from flu, allergies, colds, rheumatoid arthritis, bacterial/viral infections, hepatitis, heart disease, asthma, skin infections, ageing, chemical intoxication etc. and effective in treating cancers (Mathew et al., 2010; Umashanker and Shruti, 2011). Apart from infectious and systemic diseases, topical botanical/herbal application is also effective for specific conditions like ear infections, wounds, burns and skin irritations (Mizaei-Aghsaghali, 2012). Herbs, traditional/indigenous plants and ethnoveterinary medicines, having multiple beneficial advantages, have been used since long for strengthening of body and its immune system and to keep away or fight against diseases. Nakul Samhita, an Indian ancient literature, describes the treatment of animals with many herbs, written about 5000 B.C. Our Ayurveda system of medicine, an ancient medicinal system, is a good knowledge store for herbs and minerals having medicinal properties. Several medicinal plants used in Indian traditional medicine called Rasayanas which increases the resistance of the body against a variety of infections have attracted the attention of many scientists. It is one among the eight branches of Ayurveda which has been meant for nourishing and rejuvenating drugs with multiple applications for longevity, memory enhancement, immunomodulation and adaptogenic (Patwardhan and Gautam, 2005). Herbal therapy is also popularly called as Rasayana Chikitsa. In our country the ancient medicinal system of Ayurveda is a vast repository of knowledge in herbals and minerals of medicinal properties. The rasayana drugs are endowed with multiple properties like delaying ageing, improving mental functions and preventing diseases (Sharma, 1983). Burgeoning interest in medicinal herbs has increased scientific scrutiny of their therapeutic potential and safety, thereby providing practitioners with data to help farmers make wise decision about their use (OHara et al., 1998). Ethnoveterinary medicine deals with peoples knowledge, skills, methods, practices and beliefs about the care of their animals and to keep them healthy, which are acquired through practical experience and has traditionally been passed down orally from generation to generation (Toyang et al., 2007). Since centuries before the introduction of western and allopathic medicines, all livestock keepers relied on these traditional practices. According to the World Health Organization, at the moment, at least 80% of people in developing countries depend largely on these practices for the control and treatment of various diseases. Limitations of synthetic drugs and chemicals in terms of higher cost, anticipated toxicity and adverse effects are becoming known to the people. On the other hand, the natural medicines are more suitable for animal and human health care with the advantages of low cost and total safety (Rahal and Kumar, 2009a). Some of them are studied scientifically by in vitro and in vivo studies but most of them are yet to be scientifically validated. In the era of emerging antibiotic resistance and residual effects in food products, food safety concern, these can play wonderful role for safeguarding health of humans and animals. In the last few years there has been an exponential growth in the field of herbal medicine and these drugs are gaining popularity both in developing and developed countries because of their natural origin and less side effects. Many traditional medicines in use are derived from medicinal plants, minerals and organic matter. The World Health Organization (WHO) has listed 21,000 plants, which are used for medicinal purposes around the world. Among these 2500 species are in India, out of which 150 species are used commercially on a fairly large scale. India is the largest producer of medicinal herbs and is called as botanical garden of the world (Umashanker and Shruti, 2011). The country has one of the richest plants medical traditions in the world. There are estimated to be around 25,000 effective plant-based formulations, used in folk medicine and known to rural communities in India. There are over 1.5 million practitioners of traditional medicinal system using medicinal plants in preventive, promotional and curative applications. It is estimated that there are over 7800 medicinal drug-manufacturing units in India, which consume about 2000 tonnes of herbs annually (Verma and Singh, 2008). In literature many plants have been listed having immunomodulatory effect and some of them have been proved by using modern scientific methodologies. In this paper, few important herbs are discussed with their immunomodulatory action/properties either on laboratory animals, domestic animals or human beings. • Helpful in delaying the process of ageing. Documented systems of medicinal herbs include Chinese medicine, Japanese Kampo, Tibetan herbs, Indian Ayurveda and African healing herbs. The promotive, preventive, corrective and curative approach in health care and the medicinal plants pocessing such properties are indeed the strength of the Indian Systems of Medicine (ISM). The ancient masters of Ayurveda and Siddha organized, codified and synthesized the medicinal wisdom with sophisticated theoretical foundation and philosophical explanations. They adopted the fundamental doctrines of Darshana philosophy, particularly the Nyaya, Sankhya and Vaiseshika, which encompassed all sciences-physical, chemical, biological and spiritual. Nevertheless, the holistic approach of ISM, more particularly of Ayurveda, which internalize all aspects of health and diseases, is perhaps the greatest contribution of Indian medicine (Pushpangadan, 2006). Indian medicinal plants provide a rich source for antioxidants that are known to prevent/delay different disease conditions. The medicinal plants also contain other beneficial compounds like ingredients for functional foods. Hence, the global knowledge about Ayurveda and Indian herbals are hopefully be enhanced by information on the evidence-base of these plants. This ultimately helps in yielding rich dividends (Vaidya and Devasagayam, 2007). Modulation of immune response to alleviate diseases has long since been of interest. Herbal medicines have always been a form of therapy for livestock among resource poor smallholder farmers (Mizaei-Aghsaghali, 2012). Recently, there has been progress on the ethnomedicinal plants as immunomodulatory agents because of the fact that plant extracts have been widely investigated during last few decades in different parts of the world for their possible immunomodulatory properties. In due course, several studies have demonstrated the isolation of potential bioactive molecule and few have been tested as herbal formulations. Several plant extracts, compounds and formulations have also been patented. Herbal medicines for infectious diseases: The use of herbs and botanical extracts for antimicrobial property and immune enhancement has been practiced from very old days in nearly every culture across the globe (Ahmad et al., 2006; Roxas and Jurenka, 2007). A number of plants, plant extracts and constituents have been identified as having anti-microbial, antiviral or antifungal activities and are often considered as immune enhancing (Rios and Recios, 2005). Spices such as onion, garlic, mustard, red chilli, turmeric, clove, cinnamon, saffron, curry leaf, fenugreek and ginger are some medicinal plants and dietary constituents having antimicrobial, immunestimulating and antioxidant property (Rajendhran et al., 1998; Tilak and Devasagayam, 2006). Herbal medicines for non-infectious diseases and disorders: Herbal medicines have a complex mode of action on various organs and systems due to active ingredients present in them. They are supposed to have greater impact on different factors that promote growth and health, by improving physiological and immunological functions of body. Thus, they can be considered as more sustained and long term solutions. Special contribution of these products has been proved on microsomal system against liver dysfunctions and thereby is shown to be as efficient liver protectants. Interestingly, it has been found that Nelumbo lucifera Gaertn (Nymphaeaceae) is a well-known aquatic plant which has been used for the treatment of several disorders including skin disease, cough, inflammation, fever etc (Mukherjee et al., 2010). Anti-cancer: Several herbal preparations are proved to boost up the immune system and make the body to defend against future or existing cancer. Some of the Indian herbs with anti-tumor property are echinacea, Aloe vera, tulsi, turmeric, satavar, garlic, aqueous extracts of black pepper and cardamom etc. Aromatherapy encompassing the use of essential oils derived from different types of plant materials or parts that are claimed to possess therapeutic properties is proven as an effective anticancer therapy (Boehm et al., 2012). Another unique anticancer herb is green tea or black tea which contains tumor growth inhibiting factors as well as other polyphenols, vitamin C, carotene, fluoride, zinc, selenium (Mahima et al., 2012e), manganese, potassium, niacin and folic acid. The black tea contains theaflavins, which inhibits the chymotrypsin-like activity of the proteasome and proliferation of human multiple myeloma cells (Mujtaba and Dou, 2012). Chinese medicine also reveals various anticancerous herbal preparations which are gaining attention nowadays (Efferth et al., 2007). Moreover, in Chinese medicine, the anti-cancer activity of a mushroom called Ling Zhi which contains triterpene as the active ingredient has been evaluated by researchers. The cytotoxicity exerted by triterpene is due to alteration of proteins involved in cell proliferation and or cell death, carcinogenesis, oxidative stress, calcium signaling and ER stress (Majdalawieh and Carr, 2010; Yue et al., 2010). Immune enhancing activities: Several botanicals are found to have immune enhancing activity, demonstrated by especially Chinese workers from time to time. The immunostimulating activities of many of these components have been most widely studied in mouse, chicken and human cell lines. Emerging evidence indicates that herbal plants exert their beneficial effects on animal immune system mostly by plant secondary metabolites. For example, Coriolus versicolor extracts has unique potency for using as an adjuvant since it contains glucans containing (1,4) backbone with (1,3) and (1,6) glucocytic linkages (Ng, 1998). Ginseng with its steroidal saponine, has immune-stimulating properties including cytokine production (IL-2, IL-6, TNF-α and IFN-γ), macrophage activation and lymphocyte activity. Saponins have ability to stimulate the cell-mediated immune system, as well as to enhance the antibody production. Saponins reportedly induce the production of cytokines such as interleukins and interferons. Meyer saponins, Quillaja saponins and the butanol extract of Lonicera japonica and de-acetylated saponin-1 administered on the nasal mucosa all stimulate the immune response in vivo. Herbal plant polysaccharides, also has been extensively studied for immunomodulatory effects. The polysaccharides obtained from four Chinese herbs, Astragalus root, Isatis root, Achyranthes root and Chinese Yam, considerably improves the antibody titre in vaccinated chicken (Hashemi and Davoodi, 2012). Commercial preparations of immunomodulatory herbs is shown in Table 1. Neem tree is known as the tree of the 21st century (United Nations Declaration). It is regarded as a highly exploited medicinal plant of Indian origin, with its every part (namely root, bark, wood, twig, leaf, flower, fruit, seed, kernel and oil) having medicinal use. Neem plant extract stimulates phagocytic activity and antigen presenting ability of macrophages. It stimulates cytokines and thereby the immune system (Thatte and Dhanukar, 1997). It enhances mitogenic response of spleenocytes to concanavalin-A (Con-A). It stimulates production of IL-1, IFNγ and TNF-α reflecting activation of Th1 type of response. Also enhances antibody titres against Newcastles disease antigen in broiler chickens (Renu et al., 2003). It is an effective antiseptic for the treatment of small pox. Aqueous extract of neem possess anti-complement activity. The plant extracts are effective against allergic disorders and limiting anaphylactic reactions. Feeding of neem leaves increases immunity in immunosuppressed condition like IBD; antiviral activity against duck plague virus in poultry (Xu et al., 2012) and increase the survival rate in Asian seabass Lates calcarifer fingerlings against Vibrio harveyi infection (Talpur and Ikhwanuddin, 2013). It prevents leukocyte apoptosis mediated by cisplatin and 5-fluorouracil in mice. Neem oil selectively activates the cell mediated immune response by activating macrophages and lymphocytes. As a bioinsecticide, neem has been reported effective in the control of 400 insect species, including flies, spiders and nematodes. It enhances DTH in psoriasis patients and has anti-leprotic action (Chauhan, 2010). Guduchi means to rejuvenate dead cells. It is widely used in veterinary folk medicine and has also been claimed to be beneficial according to Ayurveda for the cure of jaundice, skin diseases, diabetes, anemia, emaciations and various infections for its anti-spasmodic, anti-inflammatory, anti-arthritic and anti-allergic properties (Chopra, 1982). It has immunopotentiating activities and is anti-bacterial, anti-allergic, anti-diabetic, analgesic and diuretic. It stimulates reticuloendothelial system, bone marrow cellularity and proliferation of stem cells and enhances the haemopoietic growth factor and IL-3. It enhances GSH and Vitamin C and so function as an effective antioxidant (Prince et al., 2004). The aqueous extract of this plant is capable of increasing leukocyte count in mice and it is also proven to have hepato-protective effect (Ganguly and Prasad, 2011). This plant extracts showed anti-neoplastic activity in cultured HeLa cells. The Cordifolioside A and syringing present in the plant extract have immunomodulatory activity (Sharma et al., 2012). It has anti-complementary activity and is a potent hepatoprotectant so effective in preventing hepatotoxicity. Immunomodulatory proteins in its stem increase the number of macrophages and its phagocytic activity (Rege et al., 1999; Aranha et al., 2012). It has been shown that mice pre-treated with G1-4A exhibited protection against mortality due to lipopolysaccharide (Desai et al., 2007). It is also helpful in prevention of cyclophosphamide induced immunosuppression in mice. It has synergistic effect with cyclophosphamide in reducing animal tumours. Also, the alcoholic extract of Tinospora cordifolia has shown to activate tumor associated macrophages and showed antitumor effect on the spontaneous T-cell lymphoma and may have some clinical implications (Singh et al., 2004). It is being used as an immunostimulant in HIV patients and also has action against avian influenza viruses. Inhibition of ochratoxin A induced suppression of chemotactic activity and production of IL-1 and TNF-α by mouse macrophages has been reported. Polyclonal B cell mitogen (G1-4A) found in its stem extract enhanced immune response in mice. By the activation of macrophages, it increases the granulocyte-macrophage colony-stimulating factor (GM-CSF), leading to leukocytosis and improved neutrophil function. It is having effect on classical complement pathway by inhibiting C3-convertase (Thatte et al., 1994). Immunosuppression due to cholestasis (obstructive jaundice) can be overcome by the use Giloy (Thatte and Dahanukar, 1989). Astragalus membranaceus root has a long tradition in Chinese medicine. It is generally considered to have immunomodulatory, anti-inflammatory and adaptogenic (stress-relieving) properties. Research shows that Astragalus root stimulates the immune system in many ways. It increases the number of stem cells in bone marrow and lymph tissue and encourages their development into active immune cells. It also enhances the bodys production of immunoglobulin and stimulates macrophages and can activate T-cells and Natural Killer (NK) cells Astragalus stimulated NK-cell activity of human peripheral blood lymphocytes and restored steroid-inhibited NK-cell activity (Mills and Bone, 2000). Its traditional and modern usage is primarily for immune-related complaints (frequent infections) or malignancies. Astragalus extracts and constituents have been shown to enhance the activity of NK cells and lymphocyte activated killing of tumors, as well as stimulate the activity of other immune cells such as macrophages and B-cells. Much of the research on this herb is published in Chinese and its usage is most often combined with several other herbal preparations making specific dosing recommendations difficult. Astagalus is generally considered safe with few reported adverse events (Cho and Leung, 2007). Ashwagandha is a potent adaptogen or vitalizer, with immunomodulatory (Kushwaha et al., 2012), antitumour and cytoprotective properties (Mishra et al,, 2000). It possess both immunostimulatory and immunosuppressive properties. It prevents myelosuppression induced by cyclophosphamide, azathioprin and prednisolone. It has the property of mobilization and activation of macrophages (phagocytosis), increases activity of lysosomal enzymes and antistress activity in mice and rat. These pharmacological activities are attributed to the presence of several alkaloids and withanolides. Extracts of Ashwagandha has antioxidant (Blecha, 2001) and detoxifying properties and reduces tumor incidence in mice and increases serum T3 and T4 in mice. Anti-carcinogenic effects in animal and cell cultures are due t o decreasing the expression of nuclear factor-kappa B, suppressing intercellular tumor necrosis factor and potentiating apoptotic signalling in cancerous cell lines. It has been shown to be immunoprotective against Bordetella pertussis infection in animals and possess better efficacy in inhibiting growth of breast and colon cancer cell lines in compare to doxorubicin. It induces inhibition of delayed hypersensitivities. Aswagandha has been proven to prevent stress induced changes in adrenal function and enhance protein synthesis. Milk fortified with it increases total proteins and body weight. Bharavi et al. (2010) has proven that Withania somnifera root powder can prevent Cadmium-induced oxidative stress in chicken. Amla is well known for its anti-oxidant and detoxification properties along with tonifying and antiaging effect (Saini et al., 2008). As an adaptogen, amla improves immunity and augments both cell mediated and humoral response. It enhances IL-2 and gamma-IFN production and inhibits apoptosis. It enhances NK cell activity and Antibody Dependent Cellular Cytotoxicity (ADCC). It acts as an immunomodulator in repeated respiratory infections in human beings. Amla possess anti-inflammatory and antipyretic properties. It is a potent immunosuppressant as that of dexamethasone and can be used in arthritis (Ganju et al., 2003). It helps to reduce inflammation and oedema (Baliga and Dsouza, 2011). As a tonic, it is prescribed for rejuvenation, recuperation and vitality. It inhibits immunosuppressive effects of Chromium on lymphocyte proliferation. A high amount of Ascorbic acid is present in the fruits of amla. It is useful for anaemia, jaundice and dyspepsia in combination with iron (Sai Ram et al., 2002). It can also be used to treat and prevent cancer (Baliga and Dsouza, 2011). Tulsi is regarded as the Queen of plants/The mother medicine of nature. It is an analgesic, anticancer, adaptogen or antistress agent and also having antidiabetic property (Hussain et al., 2001; Rahal and Kumar, 2009b). Its anti-oxidative property and inhibition of lipid peroxidation are due to the presence of eugenol (Gupta et al., 2002). Immunostimulant potential of Tulsi is helpful in treatment of immunosuppression. It shows its immunomodulatory effect by increase in IFN-Y, IL-4, T helper cells, NK cells (Mondal et al., 2011) thus reducing total bacterial count, increasing neutrophil and lymphocyte count and enhancing phagocytic activity and phagocytic index. Oil from Tulsi seed can mediate GABAergic pathways and by this it can modulate both humoral and cell-mediated immunity (Mediratta et al., 2002). Aqueous extract showed immunotherapeutic potential in bovine sub-clinical mastitis. It inhibits mast cell degranulation and histamine release in presence of allergen. It is useful in constipation and wounds. Tulsi plant has shown to enhance the production of RBC, WBC and haemoglobin in rats. It is more potent than dexamethasone in the treatment of acute viral encephalitis. Tulsi is suggested to shorten the course of illness, clinical symptoms in patients suffering from viral hepatitis and also enhances survival of viral encephalitis patients. It is also useful in allergic and inflammatory disorders due to the action of its oil and has shown to decrease significantly the symptoms of arthritis and edema (Reghunandan et al., 1995; Singh et al., 2010). It has been proven as a herbal adaptogen in reversing the Cadmium-induced oxidative stress in chicken (Bharavi et al., 2010). It has immunomodulatory and anti-inflammatory activities by suppressing the proinflammatory cytokines. It can also act as a bio-enhancer and anti-tumor agent (Patwardhan and Gautam, 2005). Its alkaloid piperine has a variety of pharmacological activities like nerve depressant, antagonistic effect on electroshock and chemo-shock seizures as well as muscular incoordination. Piperine increases bone marrow cellularity in mice and rats. It helps in prevention and control of Giardiasis in human beings. The root and fruit decoction are used in acute and chronic bronchitis and cough. It is used for wound/fracture healing with immunopotentiation. The extract from stem bark of this plant has the property of inhibition of HIV-protease. It is used in fracture and wound treatment of animals for its immunopotentiation properties. It is a cardiac tonic herbal medicine for man. It is an antineoplastic agent due to the cancer cell growth inhibitory constituents residing in its bark, stem and leaves(gallic acid, ethyl gallate and the flavone luteolin) (Pettit et al., 1996). It promotes wound healing by stimulating macrophage and fibroblast activity. The active principle Acemannan induces apoptosis in cancer cells, stimulate leukocyte and lymphocyte and cause the release of IL-1, IL-6 and TNF-α. It can modulate immune response by augmenting secondary humoral immunity in rats (Halder et al., 2012). Mucilaginous leaf-gel (Acemannan) has anti-inflammatory property. It prevents ultraviolet induced suppression of DTH by reducing keratinocyte derived immuno-suppressive cytokines. It can selectively stimulates cytokines and activates lymphocytes (Egger et al., 1996). Its isolates have shown to exert inhibitory properties against Staphylococcal infections (Lorenzetti et al., 1964) and Candidiasis (Stuart et al., 1997). It also shows some beneficial effect in antiretroviral therapy (Awodele et al., 2012). It is having antiseptic property which was first demonstrated by Louis Pasteur (Tyler, 1994). Allyl sulfides are known for antitumor, anticarcinogenic and antistress action. Organosulfur compounds of garlic-inhibit growth of tumors in animals and modulate activity of diverse chemical carcinogens. It increases NK cells production and activation and helps in maintaining homeostasis of immune function. Garlic is having effect on multiple cytokines like reduction of proinflammatory cytokines (IL1, IL6, IL8 and TNF) and stimulation of IL10 (Spelman et al., 2006). It enhances production of IL-2, augment macrophage (oxidative burst) and T lymphocyte (blastogenesis) functions. Due to its ability to influence multiple proinflammatory cytokines, it is having hypoglycaemic action and protection against inflammatory bowel disease (Ebadi, 2002). Garlic is useful in food poisoning, tympany, sterility, FMD, skin infection, contact hypersensitivity, stomach-ache, arthritis, internal parasites and rheumatism. Garlic boosts IL-10 and IL-4 and is useful in treating psoriasis (OHara et al., 1998). It possess antioxidant property also (Tilak et al., 2005). Researchers are focusing on an extract of A. sativum called ajoene, which appears to protect CD+ cells from attack by HIV early in the viral life cycle. At low concentrations, the drug appears to have little toxicity and its anti-HIV activity is 45 times more powerful than the drug dextran sulfate. Ajoene is found only in fresh A. sativum and is not readily procurable. Recent investigations reveal that A. sativum impairs the activity of the liver enzymes that process protease inhibitors and raises the protease inhibitor levels. The in vitro antiviral activity of A. sativum extract (GE) on human cytomegalovirus (HCMV) has also been evaluated in tissue cultures, plaque reduction and early antigen assay. A dose-dependent inhibitory effect of GE is evident when GE was applied simultaneously with HCMV (Guo et al., 1993). Allicin can protect against plasmodium infection by enhancing the hosts innate as well as adaptive immunity (Feng et al., 2012). It is used as a general tonic, immunostimulant and blood purifier. It possesses anti-inflammatory activity and antioxidant activity (Devasagayam et al., 2001). Curcumin inhibits growth of ovarian cancer cells and induce apoptosis in lung cancer cell lines. Anti-cancer effects are also observed in various cancer cell types including skin, colon, duodenal and ovary in the laboratory animals. Anti-cancer properties of curcumin may be mediated, at least in part by inhibition of inducible form of NO synthase. It increase intestinal IgA in animals fed a high fat diet. It is useful in mouth blisters, sprains, internal parasites, skin disease, constipation, internal injury, eye diseases, wounds, galactagogue, external parasites, sprains, mastitis, cough, cold, bone fracture, heatstroke, wounds, FMD, haematuria, broken horn and stomach-ache. Anti-inflammatory effect gives relief from rheumatoid arthritis and osteoarthritis. It is also an anti-Alzheimer's agent. It also acts as HIV-1 and HIV-2 protease inhibitor, hepatoprotective, hypoglycemic and hypolipidemic agent (Jain et al., 2007; Goyal et al., 2010). Ginger which is called The Great Medicament in Ayurveda, is effective against a variety of ailments. It is useful in constipation, food poisoning, diarrhoea, eye diseases and haematuria. It is also useful in conditions like indigestion, tympany, dysentery, stomach-ache and skin diseases. The most effective principle in exerting antimicrobial activity is citral, along with Curcumene, a sesquiterpene, which is found to inhibit Rhizoctonia solani (Agrawal et al., 2001). The ethanol extract of ginger is also bactericidal, especially against gram positive bacteria (Alzoreky and Nakahara, 2003). It also has antioxidant and anti-inflammatory property (Chang et al., 2012; Park et al., 2012). Ginseng has been in use for centuries in reducing stress and boosting energy and it has been shown to stimulate every aspect of the immune system in vertebrates (Bensky and Gamble, 1993). It is used to regenerate liver cells after toxicity or injury, even in cases of chronic disease. It is being used as anti-stress factors for very long years in human and animal medicines with proven results (Blecha, 2001). The saponins from its root stimulate lymphocytes and cytokines (Cho et al., 2002) and those cytokines include IL-1, IL-12, TNFα and INFγ (Song et al., 2002). It is used as a restorative tonic and known as an adaptogen. Panax enhances NK cell activity and increase immune cell phagocytosis. It has protective role in cancer and also possess anti-inflammatory activity. Ginseng is often used to treat feline leukemia and secondary conditions in animals arising from cancer, such as rapid weight loss cachexia and blood infections. It improves endocrine and liver function in dogs (Kwon et al., 2003) and in horses increases antibody response against Equine herpesvirus 1 when given for a few weeks prior to being vaccinated (Pearson et al., 2007). It has anti-inflammatory properties and contains high content of vitamins which helps in healing and enhances immunity. High content of Tannin is present in its leaves. It modifies the expression of Th1-and Th-2 cytokines. It up-regulates CD4+, CD8+ and CD19+ cell population and increases splenic T and B cellular proliferation. It has shown analgesic, anti-inflammatory and significant anti-tumor property against human hepatoma cells. It is also having anti-cancer property (Sun et al., 2012). It has anti-inflammatory action and stimulates macrophage cytokine production and Natural Killer (NK) cells. It can stimulates neutrophil and B-lymphocyte activity. Liquid preparations have been shown to have immune-stimulating property (Uluisik and Keskin, 2012) and enhance several white blood cell types as well as phagocytes (Burton Goldberg Group, 1999). It enhances production of specific IgG in mice. It is well known among humans as a first line of defense against the common cold and flu (Blumenthal, 2004). Extracts of Echinacea enhance phagocytosis and protect the gut from harmful microorganisms. The herb may inhibit the growth of some tumors. It is very effective in treating canine seasonal and chronic upper respiratory infections, including kennel cough (Reichling et al., 2003). The juice from the aerial portion of E. purpurea and aqueous and alcohol extracts of the roots have viral inhibition properties in cell culture (Wacker and Hilbig, 1978). It has anti-carcinogenic, anti-inflammatory and antioxidant property. Immunostimulatory action has been shown by murine peritoneal macrophages in vitro and boosting immune system of humans (Naeini et al., 2009). It is useful in diarrhoea, stomach-ache, dysentery, FMD and paraplegia (Cherng et al., 2008). The water-extractable and the alkali-extractable polysaccharides from Solanum nigrum have been proven to possess potent antitumour activity (Li et al., 2009) which may be associated with their potent immunostimulating effect (Ding et al., 2012). It causes significant increase in IFN-α, IL-2 and IFN-γ production and decrease in IL-10 expression. Its antitumor activity is reflected in activation of different immune responses in mice rather than by directly attacking cancer cells (Li et al., 2009). Ethanolic extract of A. calamus rhizome is having immunosuppressant action which inhibited proliferation of mitogen (phytohaemagglutinin) and antigen (purified protein derivative) stimulated human Peripheral Blood Mononuclear Cells (PBMCs). It also inhibited production of Nitric Oxide (NO), interleukin-2 (IL-2) and tumor necrosis factor-α (Mehrotra et al., 2003). It inhibits the production of proinflammatory cytokines, posses anti-inflammatory activity and has applicability against IgE mediated disorder. It has anti-obesity property, inhibits adipogenesis in 3T3-L1 cells and reduces lipid accumulation in fat cells. It is also effective against cattle ticks. Belska et al. (2010) demonstrated that the pectic polysaccharide from A. calamus L. in low concentrations was able to stimulate in vitro IL-12 and nitric oxide production by murine macrophages (Belska et al., 2010). Anti-inflammatory action of plant is exhibited by eugenol due to the suppression of the nuclear factor-κB pathway. It is also found that eugenol in noncytotoxic concentrations exert immunomodulatory/anti-inflammatory action on cytokine production by murine macrophages (Bachiega et al., 2012). In a study by Halder et al. (2011) it was found that clove oil can modulate the immune response by augmenting humoral immunity and decreasing cell mediated immunity (Halder et al., 2011). • Active principle: Glycyrrhizic acid, glabridin, sterine etc. It has hepatoprotective property, modulatory effect on the complement system and inhibits replication of Severe Acute Respiratory Syndrome (SARS)-associated virus. It causes an increase in the resistance to herpes simplex virus-1 infection and Candida albicans by IFN and Th2 cytokines secretion. Glycyrrhizic acid and its aglycone have actions like modulation of NF-kB and IL-10 production which explains reduction of inflammation in liver (Yoshikawa et al., 1997). It is a popular remedy for throat infections. Glycyrrhizin inhibits ROS generated by neutrophils and acts as an anti-inflammatory agent at the site of inflammation. It also possesses anti-viral activity against HIV (Akamatsu et al., 1991). Its anti-inflammatory action is based on its weak deoxycortisone-like and ACTH action. It is also a potent immunomodulatory (Borsuk et al., 2011) with anticomplimentary and antioxidant activity (Ablise et al., 2004). Glabridin from it prevents LDL oxidation (Belinky et al., 1998). Its anti-infective property is due to its effect on the production of INF and Th2 cytokines (Patwardhan and Gautam, 2005). The components of its root can modulate Bcl-2/Bax (the family of apoptotic regulatory factors) which attributes for their cytoprotective activity (Jo et al., 2004). It is effective for immunological and digestive disorders. It induces positive influence on IL-1, IL-6 and IFN-γ production and found to exhibit immune adjuvant activity with pneumococcal vaccine (Winkler et al., 2004). Its anti-inflammatory effects are due to negation of NF-KB activation and suppression of TNF-α synthesis (Sandoval-Chacoan et al., 1998; Sandoval et al., 2000). Other actions like modulation of apoptosis, tumor cell proliferation and DNA repair lead to cytoprotective effect (Sheng et al., 1998) and induce apoptosis selectively, leading to antitumor activity (Sheng et al., 2000). Quinic Acid (QA), active ingredient of Uncaria tomentosa, enhances the DNA repair and immunity and able to generate neuroprotective effects in neurons (Zhang et al., 2012). Nyctanthes arbor-tristis is a biopesticidal plant and its aqueous extract has been found to have potent immunomodulative, hepatoprotective, antileishmanial, antiviral and antifungal activities (Puri et al., 1994). It contains tertiary and quarternary alkaloids which increases immunobioactivities. In a study by Kannan et al. (2007) an ethanolic extract of N.arbor-tristis when fed orally enhanced the circulating antibody while its chronic administration of increased the total counts of White Blood Cells (WBC) and potentiated the Delayed-type Hypersensitivity (DTH) reactions (Kannan et al., 2007). It has the ability to enhance immune function (Naik and Hule, 2009). Ethanol extract of Kirayat stimulates antibody production in mice and enhances production of IFN-gamma and TNF-α. It has been found to stimulate macrophage migration, phagocytosis of E. coli and in vitro proliferation of splenic lymphocytes (Puri et al., 1993). The dichloromethane fraction of its methanolic extract was proven to possess the anticancer and immunomodulatory activity (Kumar et al., 2004). This plant showed hepatoprotective activity in mice and anti-malarial activity in dogs. It enhances IgG antibody level against S. typhimurium in mice. It is distributed throughout the world, especially in East Asia. Traditionally, it has been used to treat different cancers, including those of the digestive system and mammary gland (Lu et al., 2007). There is a renewed interest in its chemical composition and biological activities. It has been extensively employed to treat various ailments such as leprosy, abscess, rheumatism, arthritis inflammation, jaundice, abnormal leucorrhea and so on (Lai and Zhang, 2002). Moreover, it is also useful for the treatment of cancers, especially those of lung, liver and digestive system. Asparagus is used in transplantation immunology. It has been employed for preventing leucopenia produced by cyclophosphamide. A steroidal sapogenin acid from the roots of Asparagus racemosus is having potent immunomodulating property (Sharma and Varmal, 2011). Its immunomodulatory action is by significant increase of CD3+ and CD4/CD8+ % T cell activation and immunoadjuvant action is by significant up-regulation of Th1 (IL-2) and Th2 (IL-4) cytokines (Guatam et al., 2004). It is considered as a good candidate for evaluation in patients receiving cytotoxic drugs. It inhibits the carcinogen ochratoxin A induced suppression of chemotactic activity and production of IL-1 and TNF-α by mouse macrophages. It contains an anticancer agent asparagin which is useful against leukaemia. It also contains active antioxytocic saponins which have got antispasmodic effect and specific action on uterine musculature (Syamala, 1997; Gautam et al., 2009). It boosts the immune system by increasing both the cell mediated and humoral immunity. It has protection property against the worm Leishmania donovani which causes leishmaniasis and can be used as adjunt to antileishmanial chemotherapy (Sane et al., 2011). The biopolymeric fraction RLJ-NE-205 from it improves the immune system and considered as a biological response modifier (Gupta et al., 2006). It possess hepatoprotective activity, anti-inflammatory activity and is used in the management of bronchial asthma. It has role in enhancing DTH response, antibody production, macrophage migration, phagocytic activity and skin graft rejection. It inhibits ochratoxin-induced suppression of chemotactic activity and production of IL-1 and TNF-α. It also Increases haemagglutinating antibody titer, plaque-forming cells and DTH response to SRBC. It is a very useful medicine in food poisoning, internal parasites, diarrhoea, FMD, dysentery and loss of appetite. It is also found to be effective in skin diseases and hoof diseases. It has lipid lowering effects and shown to inhibit oxidation of low-density lipoproteins (Ahmed et al., 2009). It is having profound antibacterial effect which is mentioned even in the Egyptian Papyrus Ebers. The aqueous extract of the plant has shown to increase the CD4 and total WBC counts in a dose dependent manner, revealing its immune boosting capabilities (Mirabeau and Samson, 2012). Every part of the plant is having one or another medicinal properties like, leaf juice extract is administered ophthalmically to treat jaundice, dried shoot is taken orally as a cicatrizing agent and to treat insect bites, root is taken orally to facilitate expulsion of the placenta, essential oil from fresh bulb is administered by inhalation to treat cold etc. (Ross, 2001). It is useful in constipation, food poisoning, stomach-ache, fever, indigestion, dysentery, external parasites, mastitis, mouth blisters and burn. It exerts action against hoof diseases and other skin diseases like eczema. Mustard is rich in calcium and iron and helps to restore bacterial balance in the intestines. The mustard's greens are rich in vitamin A, iron and zinc and are best when eaten raw or steamed. White mustard has been used throughout the world to relieve pain and as a diuretic and an antibiotic. Mustard flour is an antiseptic and can also be used as a deodorizer. The mustard's oil can be used for pain relief of arthritic conditions and chilblains. Mustard is also an excellent expectorant and a very powerful natural emetic. Due to its chemical components, seeds can be widely employed in cancer, non-genetic diabetes, hyperglycemia, hyperlipidemia and hypercholesterolemia (Szollosi, 2011). Traditionally it has been found useful in tympany, diarrhoea, food poisoning, constipation, haematuria, fever, indigestion and loss of appetite (Wagensteen et al., 2004). Its methanol derived stem extract is having antibacterial property, due to its ferrous sequestering activity (Wong and Kitts, 2006). The aqueous crude extract has shown to stimulate the peripheral blood mononuclear cells and increases INF-γ secretion (Cherng et al., 2008). It possess antifungal, antiviral, anti-diabetic, anti-inflammatory and anti-mutagenic activities. Recent studies have shown new promising antiviral sesquiterpene coumarins from this herb. It is also shown to be a remedy of great value as a carminative in flatulence and colic. The essential oil is eliminated through the lungs and is excellent for asthmatic bronchitis and whooping cough. It also exerts a significant anthelmintic action against roundworms and pinworms. It has been found useful in treating neck sore, paralysis, stomach-ache and indigestion (Iranshahy and Iranshahi, 2011). Banana is the best natural source of vitamin B6. This vitamin is required for the production of antibody for having a healthy immune system. The presence of high quantity of vitamin B6 in banana also makes it a food item that helps human boy in making hemoglobin. Beneficial in galactagogue, tympany, diarrhea, haematuria, prolapse of uterus, heat-stroke, sterility, dysentery, loss of appetite, indigestion, mastitis, food poisoning and post partum complaints. Banana is rich in potassium, an agent that helps in keeping the nervous system and heart healthy. The presence of high amount of potassium in banana makes it a beneficial fruit for the bones and kidneys. Antifungal and antibiotic principles are found in the peel and pulp of fully ripe bananas (Sampath Kumar et al., 2012). It possess immunomodultory effects due to the immunosuppressive action (Sen et al., 2002). Ethanolic extract of Boerhaavia diffusa was shown to inhibit the cell proliferation significantly (Mungantiwar et al., 1999). Extracts of B. diffusa roots inhibited human NK cell cytotoxicity in vitro, production of nitric oxide in mouse macrophage cells, interleukin-2 and tumor necrosis factor-α (TNF-α), in human PBMCs, demonstrating its immunosuppressive potential effect (Mehrotra et al., 2002). It also exhibits antidiabetic, anti-metastatic, antioxidant, antiproliferative and antiestrogenic, analgesic, anti-inflammatory, antibacterial activity. It is having anticancerous and anthelmintic actions. Inhalation with its leaves and seeds is found useful in whooping cough, asthma and other respiratory diseases. Root, leaf and seed are febrifuge, antidiarrhoeal, anticatarrhal and are effective in insanity, cerebral complications and skin ailments. Leaf can be used as antitumour, antirheumatic and vermicide agent. Its warm leaf smeared with an oil is used as a bandage or as a poultice for treating rheumatic swellings of joints. The alkaloids present in the leaves are effective antimicrobial (Dhankhar et al., 2012) and anticancerous drugs. Vinblastine is used in combination with other anticancer agents for the treatment of lymphocytic lymphoma, Hodgkins disease, testicular carcinoma and choriocarcinoma (Narayana and Dimri, 1990). The roots are considered as an anthelmintic and vermifuge, whereas root bark and stem bark of this plant are reported to act as vermifuge and purgative (Akhtar et al., 2000). It increases both humoral as well as cellular immune response (Bharani et al., 2010). Its fruit contains Pyrrole alkaloids, which activate the macrophages and enhance the immune response (Kim et al., 2013). The fruit has been used as an anthelmintic, cathartic, aphrodisiac, lithotropic and styptic. It has also been used in external applications for the control of parasitic infections of the skin, as an antiseptic for ears and systemically for urinary disorders (Sharma and Varmal, 2011); antituberculous drug (Hong et al., 2010); against keratinocyte hyper-proliferative disorders (Valacchi et al., 2009). It is commonly used in traditional ayurvedic and unani medicine as aphrodisiac, tonic, sedative and blood diseases etc (Pawar et al., 2010). Methanol extracts of this plant has got in-vitro antimicrobial activity against bovine mastitis pathogens like S. aureus and E. coli (Mubarack et al., 2011). Herbal and traditional botanical products ideally have multiple effects and are helpful in a variety of disease conditions, for beneficial effects on human health as well as their companion/domestic animals. When considering on a global basis, the use of plant products as immunostimulants has a traditional history not only in India but also in almost all ancient civilizations including Chinese, Arab and American. These are good alternatives to conventional chemotherapy. Same immunomodulatory herbs at a glance are shown in Fig. 1. As India is having a rich biodiversity of herbs and medicinal plants, efforts should be made in their identification and testing/validation for their immunomodulatory properties and to prepare prophylactic and therapeutic formulations for safeguarding animal health and production, as well as for human health. Research and development (R and D) programs should be encouraged for their scientific validation. By quality control approach, adulterations of these precious preparations with pesticide, heavy metal residues or other drugs could be avoided. Integrated and holistic monitoring of biological process is necessary to achieve clinical success (Multiple immunomodulating approaches). Historical knowledge from the great traditions like Ayurveda and others will have an important role in bioprospecting-drug discovery utilizing traditional knowledge of herbs, medicinal plants and indigenously well known drugs being used since ancient times. Integration of modern medicine, traditional knowledge and use of science and technologies with a systems biology approach can be most suitable in this regard. Herbal and traditional/indigenous preparations need to be popularized for their wide application and acceptance, for which promotional approaches need attention so that their full potential can be utilized for safeguarding health and production in livestock, pet and domestic animals, poultry and laboratory animals apart from numerous human health benefits. Ablise, M., B. Leininger-Muller, C.D. Wong, G. Siest, V. Loppinet and S. Visvikis, 2004. Synthesis and in vitro antioxidant activity of glycyrrhetinic acid derivatives tested with the cytochrome P450/NADPH system. Chem. Pharm. Bull., 52: 1436-1439. Agarwal, M., S. Walia, S. Dhingra and B.P. Khambay, 2001. Insect growth inhibition, antifeedant and antifungal activity of compounds isolated/derived from Zingiber officinale Roscoe (ginger) rhizomes. Pest Manage. Sci., 57: 289-300. Ahmad, A.H., A. Rahal and A. Tripathi, 2006. Optimising drug potential of plants. Proceedings of the Symposium on Recent Trends in Development of Herbal Drugs: Challenges and Opportunities and 6th Annual Conference of ISVPT, November 23-25, 2006, Ranchi, India, pp: 9-9. Ahmed, A.A., N.I. Bassuony, S.E.H.S. Awad, A.M. Aiad and S.A. Mohamed, 2009. Adding natural juice of vegetables and fruitage to ruminant diets (B) nutrients utilization, microbial safety and immunity, effect of diets suplemented with lemon, onion and garlic juice fed to growing buffalo calves. World J. Agric. Sci., 5: 456-465. Akamatsu, H., J. Komura, Y. Asada and Y. Niwa, 1991. Mechanism of anti-inflammatory action of glycyrrhizin: Effect on neutrophil functions including reactive oxygen species generation. Planta Med., 57: 119-121. Akhtar, M.S., Z. Iqbal, M.N. Khan and M. Lateef, 2000. Anthelmintic activity of medicinal plants with particular reference to their use in animals in Indo-Pakistan subcontinent. Small Rumin. Res., 38: 99-107. Alzoreky, N.S. and K. Nakahara, 2003. Antibacterial activity of extracts from some edible plants commonly consumed in Asia. Int. J. Food Microbiol., 80: 223-230. Aranha, I., F. Clement and Y.P. Venkatesh, 2012. Immunostimulatory properties of the major protein from the stem of the Ayurvedic medicinal herb, guduchi (Tinospora cordifolia). J. Ethnopharmacol., 139: 366-372. Archana, S.J., R. Paul and A. Tiwari, 2011. Indian medicinal plants: A rich source of natural immuno-modulator. Int. J. Pharmacol., 7: 198-205. Awodele, O., S.O. Olayemi, T.A. Adeyemo, T.A. Sanya and D.C. Dolapo, 2012. Use of complementary medicine amongst patients on antiretroviral drugs in an HIV treatment centre in Lagos, Nigeria. Curr. Drug Saf., 7: 120-125. Bachiega, T.F., J.P.B. de Sousa, J.K. Bastos and J.M. Sforcin, 2012. Clove and eugenol in noncytotoxic concentrations exert immunomodulatory/anti-inflammatory action on cytokine production by murine macrophages. J. Pharm. Pharmacol., 64: 610-616. Baliga, M.S. and J.J. Dsouza, 2011. Amla (Emblica officinalis Gaertn), a wonder berry in the treatment and prevention of cancer. Eur. J. Cancer Prev., 20: 225-239. Belinky, P.A., M. Aviram, S. Mahmood and and J. Vaya, 1998. Structural aspects of the inhibitory effect of glabridin on LDL oxidation. Free Radical Biol. Med., 24: 1419-1429. Belska, N.V., A.M. Guriev, M.G. Danilets, E.S. Trophimova and E.G. Uchasova et al., 2010. Water-soluble polysaccharide obtained from Acorus calamus L. classically activates macrophages and stimulates Th1 response. Int. Immunopharmacol., 10: 933-942. Bensky, D. and A. Gamble, 1993. Chinese Herbal Medicine: Materia Medica. Eastland Press Inc., Seattle, USA. Bharani, S.E., M. Asad, S.S. Dhamanigi and G.K. Chandrakala, 2010. Immunomodulatory activity of methanolic extract of Morus alba Linn. (mulberry) leaves. Pak. J. Pharm. Sci., 23: 63-68. Blecha, F., 2001. Immunomodulators for prevention and treatment of infectious diseases in food-producing animals. Vet. Clin. North Am. Food Anim. Pract., 17: 621-633. Blumenthal, M., 2004. Echinacea trial. Altern. Ther. Health Med., 10: 12-14. Boehm, K., A. Bussing and T. Ostermann, 2012. Aromatherapy as an adjuvant treatment in cancer care: A descriptive systematic review. Afr. J. Traditional Complementary Altern. Med., 9: 503-518. Borsuk, O.S., N.V. Masnaya, E.Y. Sherstoboev, N.V. Isaykina, G.I. Kalinkina and D.V. Reihart, 2011. Effects of drugs of plant origin on the development of the immune response. Bull. Exp. Biol. Med., 151: 194-196. Burton Goldberg Group, 1999. Alternative Medicine: The Definitive Guide. Future Medicine Publishing, Tiburon, CA., USA., ISBN-13: 9781887299336 pp: 263. Chang, Y.P., C.H. Liu, C.C. Wu, C.M. Chiang, J.L. Lian and S.L. Hsieh, 2012. Dietary administration of zingerone to enhance growth, non-specific immune response and resistance to Vibrio alginolyticus in Pacific white shrimp (Litopenaeus vannamei) juveniles. Fish Shellfish Immunol., 32: 284-290. Cherng, J.M., W. Chiang and L.C. Chiang, 2008. Immunomodulatory activities of common vegetables and spices of Umbelliferae and its related coumarins and flavonoids. Food Chem., 106: 944-950. Cho, J.Y., A.R. Kim, E.S. Yoo, K.U. Baik and M.H. Park, 2002. Ginsenosides from Panax ginseng differentially regulate lymphocyte proliferation. Planta Med., 68: 497-500. Cho, W.C. and K.N. Leung, 2007. In vitro and in vivo immunomodulating and immunorestorative effects of Astragalus membranaceus. J. Ethnopharmacol., 113: 132-141. Devasagayam, T.P.A., J.P. Kamat and N. Sreejayan, 2001. Antioxidant Action of Curcumin. In: Micronutrients and Health: Molecular Biological Mechanisms, Nesaretnam, K. and L. Packer (Eds.). AOCS Press, USA, pp: 42-59. Dhama, K., T. Ruchi, R. Barathidasan and S.D. Singh, 2012. Novel immunomodulatory and therapeutic approaches for combating viral diseases of poultry: The perspectives. Proceedings of the 21st National Conference of Indian Virological Society, November 8-10, 2012, Uttarakhand, India, pp: 146-155. Dhankhar, S., S. Dhankhar, M. Kumar, S. Ruhil, M. Balhara and A.K. Chhillar, 2012. Analysis toward innovative herbal antibacterial and antifungal drugs. Recent Pat. Antiinfect. Drug Discov., 7: 242-248. Ding, X., F. Zhu and S. Gao, 2012. Purification, antitumour and immunomodulatory activity of water-extractable and alkali-extractable polysaccharides from Solanum nigrum L. Food Chem., 131: 677-684. Ebadi, M., 2002. Pharmacodynamic Basis of Herbal Medicines. CRC Press, Washington, DC. Efferth, T., P.C.H. Li, V.S.B. Konkimalla and B. Kaina, 2007. From traditional Chinese medicine to rational cancer therapy. Trends Mol. Med., 13: 353-361. Egger, S.F., G.S. Brown, L.S. Kelsey, K.M. Yates, L.J. Rosenberg and J.E. Talmadge, 1996. Studies on optimal dose and administration schedule of a hematopoietic stimulatory beta-(1,4)-linked mannan. Int. J. Immunopharmacol., 18: 113-126. Ganguly, S. and A. Prasad, 2011. Role of plant extracts and cow urine distillate as immunomodulators: A review. J. Med. Plant Res., 5: 649-651. Gautam, M., S. Saha, S. Bani, A. Kaul and S. Mishra et al., 2009. Immunomodulatory activity of Asparagus racemosus on systemic Th1/Th2 immunity: Implications for immunoadjuvant potential. J. Ethnopharmacol., 121: 241-247. Goyal, B.M., P. Bansal, V. Gupta, S. Kumar, R. Singh and M. Maithani, 2010. Pharmacological potential of Boerhaavia diffusa: An overview. Int. J. Pharm. Sci. Drug Res., 2: 17-22. Guatam, M., S. Diwanay, S. Gairola, Y.S. Shinde, P. Patki and B. Patwardhan, 2004. Immunoadjuvant potential of Asparagus racemosus aqeous extract in experimental system. J. Ethnopharmacol., 91: 251-255. Guo, N.L., D.P. Lu, G.L. Woods, E. Reed, G.Z. Zhou, L.B. Zhang and R.H. Waldman, 1993. Demonstration of the anti-viral activity of garlic extract against human cytomegalovirus in vitro. Chinese Med. J., 106: 93-96. Gupta, A., A. Khajuria, J. Singh, K.L. Bedi and N.K. Satti et al., 2006. Immunomodulatory activity of biopolymeric fraction RLJ-NE-205 from Picrorhiza kurroa. Int. Immunopharmacol., 6: 1543-1549. Gupta, S.K., J. Prakash and S. Srivastava, 2002. Validation of claim of Tulsi, Ocimum sanctum Linn. as a medicinal plant. Indian J. Exp. Biol., 40: 765-773. Halder, S., A.K. Mehta and P.K. Mediratta, 2012. Augmented humoral immune response and decreased cell-mediated immunity by Aloe vera in rats. Inflammopharmacology, 20: 343-346. Halder, S., A.K. Mehta, P.K. Mediratta and K.K. Sharma, 2011. Essential oil of clove (Eugenia caryophyllata) augments the humoral immune response but decreases cell mediated immunity. Phytother. Res., 25: 1254-1256. Hong, Q., D.E. Minter, S.G. Franzblau, M. Arfan, H. Amin and M.G. Reinecke, 2010. Anti-tuberculosis compounds from Mallotus philippinensis. Nat. Prod. Commun., 5: 211-217. Iranshahy, M. and M. Iranshahi, 2011. Traditional uses, phytochemistry and pharmacology of asafoetida (Ferula assa-foetida oleo-gum-resin): A review. J. Ethnopharmacol., 134: 1-10. Jain, S., S. Shrivastava, S. Nayak and S. Sumbhate, 2007. Recent trends in Curcuma longa Linn. Pharmacogn. Rev., 1: 119-128. Jo, E.H., H.D. Hong, N.C. Ahn, J.W. Jung and S.R. Yang et al., 2004. Modulations of the Bcl-2/Bax family were involved in the chemopreventive effects of licorice root (Glycyrrhiza uralensis Fisch) in MCF-7 human breast cancer cell. J. Agric. Food Chem., 52: 1715-1719. Kamiyama, H., S. Takano, E. Ishikawa, K. Tsuboi and A. Matsumura, 2005. Anti-angiogenic and immunomodulatory effect of the herbal medicine Juzen-taiho-to on malignant glioma. Biol. Pharm. Bull., 28: 2111-2116. Kannan, M., A.J.A.R. Singh, T.A. Kumar, P. Jegatheswari and S. Subburayalu, 2007. Studies on immunobioactivities of Nyctanthes arbortristis (Oleaceae). Afr. J. Microbiol. Res., 1: 88-91. Kim, S.B., B.Y. Chang, Y.H. Jo, S.H. Lee and S.B. Han et al., 2013. Macrophage activating activity of pyrrole alkaloids from Morus alba fruits. J. Ethnopharmacol., 145: 393-396. Kumar, R.A., K. Sridevi, N.V. Kumar, S. Nanduri and S. Rajagopal, 2004. Anticancer and immunostimulatory compounds from Andrographis paniculata. J. Ethnopharm., 92: 291-295. Kwon, Y.S., K.H. Jang and I.H. Jang, 2003. The effects of Korean red ginseng (Ginseng radix Rubra) on liver regeneration after partial hepatectomy in dogs. J. Vet. Sci., 4: 83-92. Lai, P.F. and H.Y. Zhang, 2002. Research progress of Maorenshen (Radix Actinidiae Macrospermae): A habitually used traditional Chinese herbal drug in Zhejiang province of China. Zhejiang Zhong Yi Xue Yuan Xue Bao., 26: 77-78. Li, J., Q.W. Li, D.W. Gao, Z.S. Han and W.Z. Lu, 2009. Antitumor and immunomodulating effects of polysaccharides isolated from Solanum nigrum L. Phytother. Res., 23: 1524-1530. Lorenzetti, L.J., R. Salisbury, J.L. Beal and J.N. Baldwin, 1964. Bacteriostatic property of Aloe vera. J. Pharm. Sci., 53: 1287-1287. Lu, Y., J. Fan, Y. Zhao, S. Chen, X. Zheng, Y. Yin and C. Fu, 2007. Immunomodulatory activity of aqueous extract of Actinidia macrosperma. Asia Pac. J. Clin. Nutr., 16: 261-265. Mahima, A.K. Verma, A. Kumar, A. Rahal, V. Kumar and D. Roy, 2012. Inorganic versus organic selenium supplementation: A review. Pak. J. Biol. Sci., 15: 418-425. Mahima, A.K. Verma, A. Kumar, V. Kumar and A. Rahal, 2012. Designer egg: Future prospects. Asian J. Poult. Sci., 6: 97-100. Mahima, A.K. Verma, A. Kumar, V. Kumar and D. Roy, 2012. Scope of biotechnology in animal nutrition. Asian J. Anim. Sci., 6: 316-318. Majdalawieh, A.F. and R.I. Carr, 2010. In vitro investigation of the potential immunomodulatory and anti-cancer activities of black pepper (Piper nigrum) and cardamom (Elettaria cardamomum). J. Med. Food., 13: 371-381. Mediratta, P.K., K.K. Sharma and S. Singh, 2002. Evaluation of immunomodulatory potential of Ocimum sanctum seed oil and its possible mechanism of action. J. Ethanopharmacol., 80: 15-20. Mills, S. and K. Bone, 2000. Principles and Practice Of Phytotherapy. Churchill Livingstone, Edinburgh, Uk, pp: 34-37. Mirabeau, T.Y. and E.S. Samson, 2012. Effect of Allium cepa and Allium sativum on some immunological cells in rats. Afr. J. Trad. Complement. Alter. Med., Vol. 9. Mondal, S., S. Varma, V.D. Bamola, S.N. Naik and B.R. Mirdha et al., 2011. Double-blinded randomized controlled trial for immunomodulatory effects of Tulsi (Ocimum sanctum Linn.) leaf extract on healthy volunteers. J. Ethnopharmacol., 136: 452-456. Mubarack, H.M., A. Doss, R. Dhanabalan and R. Venkataswamy, 2011. In vitro antimicrobial effects of some selected plants against bovine mastitis pathogens. Hygeia J. D. Med., 3: 71-75. Mujtaba, T. and Q.P. Dou, 2012. Black tea polyphenols inhibit tumor proteasome activity. In vivo, 26: 197-202. Mukherjee, D., T.N. Khatua, P. Venkatesh, B.P. Saha and P.K. Mukherjee, 2010. Immunomodulatory potential of rhizome and seed extracts of Nelumbo nucifera Gaertn. J. Ethnopharmacol., 128: 490-494. Naeini, A.R., A.R. Khosravi, H. Tajbakhsh, T. Ghazanfari and Y. Roya, 2009. Anticandida and immunomodulatory effects of Foeniculum vulgare mill In vitro. Daneshvar Med., 16: 7-20. Naik, S.R. and A. Hule, 2009. Evaluation of immunomodulatory activity of an extract of andrographolides from Andographis paniculata. Planta Medica, 75: 785-791. Narayana, M.R. and B.P. Dimri, 1990. Periwinkle and its Cultivation in India. CIMAP, Lucknow, India, Pages: 12. Ng, T.B., 1998. A review of research on the protein-bound polysaccharide (polysaccharopeptide PSP) from the mushroom Coriolus versicolor (Basidiomycetes: Polyporaceae). Gen. Pharmacol. : Vascular Syst., 30: 1-4. O'Hara, M., D. Kiefer, K. Farrell and K. Kemper, 1998. A review of 12 commonly used medicinal herbs. Arch. Fam. Med., 7: 523-536. Patwardhan, B. and M. Gautam, 2005. Botanical immunodrugs: Scope and opportunities. Drug Discov. Today, 10: 495-502. Pawar, R.S., A.P. Jain, S. Lodhi and A.K. Singhai, 2010. Erythropoietic activity of Asteracantha longifolia (Nees.) in rats. J. Ethnopharmacol., 129: 280-282. Pearson, W., S. Omar and A.F. Clarke, 2007. Low-dose ginseng (Panax quinquefolium) modulates the course and magnitude of the antibody response to vaccination against Equid herpesvirus I in horses. Can. J. Vet. Res., 71: 213-217. Pettit, G.R., M.S. Hoard, D.L. Doubek, J.M. Schmidt, R.K. Pettit, L.P. Tackett and J.C. Chapuis, 1996. Antineoplastic agents 338. The cancer cell growth inhibitory. Constituents of Terminalia arjuna (Combretaceae). J. Ethnopharmacol., 53: 57-63. Prince, P.S., M. Padmanabhan and V.P. Menon, 2004. Restoration of antioxidant defence by ethanolic Tinospora cordifolia root extract in alloxan-induced diabetic liver and kidney. Phytother. Res., 18: 785-787. Puri, A., R. Saxena, R.P. Saxena, K.C. Saxena, V. Srivastav and J.S. Tandon, 1993. Immunostimulant agents from Andrographis paniculata. J. Nat. Prod., 58: 995-999. Ragupathi, G., K.S. Yeung, P.C. Leung, M. Lee and C.B. Lau et al., 2008. Evaluation of widely consumed botanicals as immunological adjuvants. Vaccine, 26: 4860-4865. Rahal, A. and A. Kumar, 2009. Tulsi: A miracle herb in the hands of traditional house lady. Proceedings of the 10th Annual Convention of Indian Association of Lady Veterinarians and National Symposium on Contribution of Women Veterinarians in Upliftment of Livestock Production Through New Technologies, (CIALV'09), College of Veterinary Sciences and Animal Husbandry, Jawaharlal Nehru Krishi Vishwa Vidyalaya, Jabalpur -. Rajendhran, J., M.A. Mani and K. Navaneethakannan, 1998. Antimicrobial activity of some selected medicinal plants. Geobios, 25: 208-282. Rege, N.N., U.M. Thatte and S.A. Dahanukar, 1999. Adaptogenic properties of six rasayana herbs used in Ayurvedic medicine. Phytother. Res., 13: 275-291. Reghunandan, R., S. Sood, V. Reghunandan, R.M. Mehta and G.P. Singh, 1995. Effect of Ocimum sanctum Linn (Tulsi) extract on testicular function. Indian J. Med. Res., 49: 83-87. Reichling, J., J. Fitzi, J. Furst-Jucker, S. Bucher and R. Saller, 2003. Echinacea powder: Treatment for canine chronic and seasonal upper respiratory tract infections. Schweiz. Arch. Tierheilkd., 145: 223-231. Ross, I.A., 2001. Medicinal Plants of the World: Chemical Constituents, Traditional and Modern Medicinal Uses. Vol. 2, Humana Press, Totowa, New Jersey, ISBN: 9780896038776, Pages: 487. Roxas, M. and J. Jurenka., 2007. Colds and influenza: A review of diagnosis and conventional, botanical and nutritional considerations. Altern. Med. Rev., 12: 25-48. Sai Ram, M., D. Neetu, B. Yogesh, B. Anju and P. Dipti et al., 2002. Cyto-protective and immunomodulating properties of Amla (Emblica officinalis) on lymphocytes: An in-vitro study. J. Ethnopharmacol., 81: 5-10. Saini, A., S. Sharma and S. Chhibber, 2008. Protective efficacy of Emblica officinalis against Klebsiella pneumoniae induced pneumonia in mice. Indian J. Med. Res., 128: 188-193. Sampath Kumar, K.P., D. Bhowmik, S. Duraivel and M. Umadevi, 2012. Traditional and medicinal uses of banana. J. Pharm. Phytochem., 1: 57-70. Sandoval, M., R.M. Charbonnet, N.N. Okuhama, J. Roberts, Z. Krenova, A.M. Trentacosti and M.J. Miller, 2000. Cat's claw inhibits TNFα production and scavenges free radicals: Role in cytoprotection. Free Radic. Biol. Med., 29: 71-78. Sandoval-Chacoan, M., J.H. Thompson, X.J. Zhang, X. Liu and E.E. Mannick et al., 1998. Antiinflammatory actions of cat's claw: The role of NF-kB. Aliment Pharmacol. Ther., 12: 1279-1289. Sane, S.A., N. Shakya and S. Gupta, 2011. Immunomodulatory effect of picroliv on the efficacy of paromomycin and miltefosine in combination in experimental visceral leishmaniasis. Exp. Parasitol., 127: 376-381. Sen, T., A.K. Dhara, S. Bhattacharjee, S. Pal and A.K. Nag Chaudhuri, 2002. Antioxidant activity of the methanol fraction of Pluchea indica root extract. Phytother. Res., 16: 331-335. Sharma, J. and R. Varmal, 2011. A review on endangered plant of Mallotus philippensis (Lam.) M.Arg. Pharmacologyonline, 3: 1256-1265. Sharma, P., 1983. Chikithsasthana. In: Charaka Samhita, Tripathi, B.N. (Ed.). Chaukhambha Surbharti Publication, Varanasi, India. Sharma, U., M. Bala, N. Kumar, B. Singh, R.K. Munshi and S. Bhalerao, 2012. Immunomodulatory active compounds from Tinospora cordifolia. J. Ethnopharmacol., 141: 918-926. Sheng, Y., R.W. Pero and H. Wagner, 2000. Treatment of chemotherapy-induced leukopenia in a rat model with aqueous extract from Uncaria tomentosa. Phytomedicine, 7: 137-143. Sheng, Y., R.W. Pero, A. Amiri and C. Bryngelsson, 1998. Induction of apoptosis and inhibition of proliferation in human tumor cells treated with extracts of Uncaria tomentosa. Anticancer Res., 5A: 3363-3368. Singh, M.K., K. Nagori and D.K. Tripathi, 2010. Potential analgesic and anti-pyretic herbal drugs: A comparative review of marketed products. Int. J. Phytomed., 2: 197-209. Song, J.Y., S.K. Han, E.H. Son, S.N. Pyo, Y.S. Yun, and S.Y. Yi, 2002. Induction of secretory and tumoricidal activities in peritoneal macrophages by ginsan. Int. Immunopharmacol., 2: 857-865. Spelman, K., J. Burns, D. Nichols, N. Winters, S. Ottersberg and M. Tenborg, 2006. Modulation of cytokine expression by traditional medicines: A review of herbal immunomodulators. Altern. Med. Rev., 11: 128-150. Stuart, R.W., D.L. Lefkowitz, J.A. Lincoln, K. Howard, M.P. Gelderman and S.S. Lefkowitz, 1997. Upregulation of phagocytosis and candicidal activity of macrophages exposed to the immunostimulant, acemannan. Int. J. Immunopharm., 19: 75-82. Syamala, B., 1997. Asparagus-an antacid and uterine tonic. Science Express dt. 1.7. pp: 8-8. Szollosi, R., 2011. Indian Mustard (Brassica juncea L.) Seeds in Health. In: Nuts and Seeds in Health and Disease Prevention, Preedy, V.R., R.R. Watsonand and V.B. Patel (Eds.). Academic Press, London, ISBN-13: 9780123756886, pp: 671-676. Thatte, U.M. and S.A. Dahanukar, 1989. Immunotherapeutic modification of experimental infections by Indian medicinal plants. Phytother. Res., 3: 43-49. Thatte, U.M., S.G. Rao and S.A. Dahanukar, 1994. Tinospora cordifolia induces colony stimulating activity in serum. J. Postgrad. Med., 40: 202-203. Toyang, N.J., J. Wanyama, M. Nuwanyakpa and S. Django, 2007. Ethnoveterinary Medicine: A Practical Approach for the Treatment of Cattle Diseases in sub-Saharan Africa. 2nd Edn., Agromisa, The Netherlands, ISBN-13: 9789290813668, Pages: 87. Tyler, V.E., 1994. Herbs of Choice: The Therapeutic use of Phytomedicinals. Haworth Press, New York, Pages: 209. Upadhayay, H., A. Kuma, A.K. Verma, A. Rahal and S. Mahajan, 2011. Medicinal values of hot aqueous extracts (HAE) of Sonchus Asper (Prickly Sow Thistle) leaves against bacterial and mycotic pathogens. Proceedings of the world congress for man and Nature Global Climate Change and Biodiversity Conservation, November 11-13, 2011, Haridwar, India, Uttarakhand, India, pp: 407-407-. Valacchi, G., A. Pecorelli, M. Mencarelli, P. Carbotti, V. Fortino, M. Muscettola and E. Maioli, 2009. Rottlerin: A multifaced regulator of keratinocyte cell cycle. Exp. 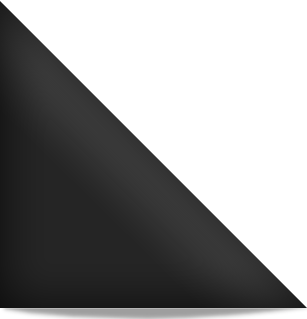 Dermatol., 18: 516-521. Verma, A.K., 2005. Cowpathy and human health. Indian Cow: Scient. Econ. J., 2: 39-45. Verma, A.K., A. Kumar, K. Dhama Mahima and A. Rahal, 2012. Pandemic preparedness for control of influenza viruses. Proceedings of the International Symposium on One Health: Way Forward to Challenges in Food Safety and Zoonoses in 21 Century and th XI Annual Conference of Indian Association of Veterinary Public Health Specialists, December 13-14, 2012, Ludhiana, India -. Verma, S. and S.P. Singh, 2008. Current and future status of herbal medicines. Vet. World, 1: 347-350. Wacker, A. and W. Hilbig, 1978. Virus-inhibition by echinacea purpurea. Planta Med., 33: 89-102. [Article in German]. Winkler, C., B. Wirleitner, K. Schroecksnadel, H. Schennach and E. Mur et al., 2004. In vitro effect of two extracts and two pure alkaloid preparations of Uncaria tomentosa and peripheral blood mononuclear cells. Plants Med., 70: 205-210. Yoshikawa, M., Y. Matsui, H. Kawamoto, N. Umemoto and K. Oku et al., 1997. Effects of glycyrrhizin on immune-mediated cytotoxicity. J. Gastroenterol. Hepatol., 12: 243-248. Yue, Q.X., X.Y. Song, C. Ma, L.X. Feng and S.H. Guan et al., 2010. Effects of triterpenes from Ganoderma lucidum on protein expression profile of HeLa cells. Phytomedicine, 17: 606-613.